Here's a new one. An online retrospective for an unknown filmmaker. Well that's the name of the game here at NoBudge, highlighting emerging filmmakers before anyone classifies them "emerging". So, here you have "The Diaries of Ahmed Khawaja", a four part doc/fiction hybrid series, a special NoBudge presentation, featuring 3 World Premieres and a re-release, coming in October. If you ask me, Ahmed Khawaja has created some of the most fascinating film work of the last couple years, and he's made a lot of it, starting from his days at Boston University as a restless film student pretending to be James Cagney and James Dean...The films in question are largely structured around Khawaja's friendship with Andre Puca, a friendship rooted in performance, a collaborative pursuit to always keep things interesting, even when nothing interesting is happening. There's a bellowing back and forth, a need to fill air, to soak up dead time. I wouldn't classify the diaries as mundane, even though there are passages of nothing but idle chatter, because Khawaja never lets the balloon hit the ground. He's so excitable, so desperate to capture his youth and friends. Once you're on board, it's never boring. 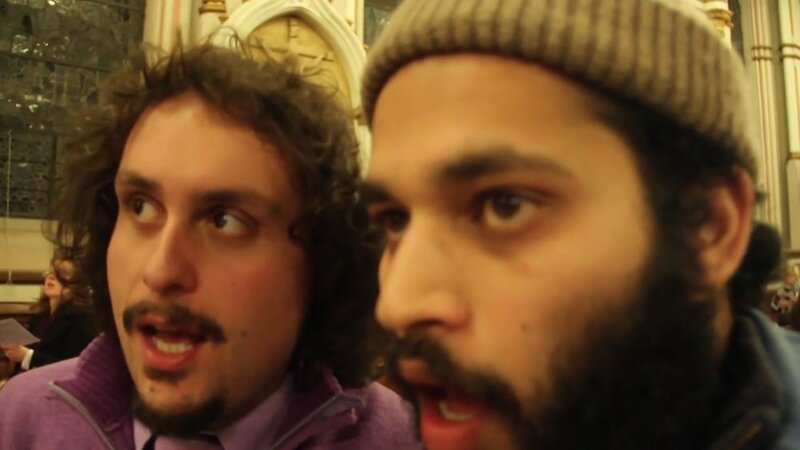 We haven't seen a figure quite like Khawaja, an irreverent Indian Muslim obsessed with filmmaking, obsessed with America, desperately documenting every day, documenting his friends, his family (who wish he would turn off the camera and get a job, naturally) with a wry humor, a jazzy bent. The series touches on so many things: friends, strangers, religions, youth, narcissism, homelands and new lands. They capture a funny and impressionable young man in such detail we feel we know him, we see many sides of him, sides that aren't always flattering. I wouldn't be surprised if Khawaja went on to become a famous international filmmaker, or alternatively, never got an ounce of credit. But these films, his diaries between 2007 and now, aren't going anywhere. They're indelible documents of time and place, personality and nationality. And, in a fair world, they would announce an "emerging" figure in world cinema.